The VW type 87 is basically a standard VW sedan with a slightlybeefed up suspension and an altered back seat. Unlike the regular sedan, thisbeetle had four wheel drive and was full intended to be an off-road vehicle. Toaccomodate the additional shifter, the brake handle was moved forward and to oneside. It also had widened fenders and running boards as well as larger off roadtires. These type 87s all had open roofs. Another modification from the standardbeetle was the removal of the rear bench seat and the installation of a singleseat typical of what was in the front. This left a storage area to the right ofthe back seat for things like radios and the like. A clip on the door posts heldweapons. The type 87 actually had several different subtypes. The type 870 had a four seat Kubelwagen body. The 87 1 had a three seat Kubelwagen body andthe 87 7 had a closed sedan body. According to the reference, there is no proofthat any more than 3 sedan bodied four wheel drive type 87s were actually built.There are only records for one cabriolet (open roof) four wheel drive sedanhaving actually been built and that was designated a type 98. In the referencethe only photos of a four wheel drive cabriolet are of the single test car,which was built in late 1943. According to the history section of the kit instructions, only afew of the cabriolet four wheel drive versions were built and all of them weredelivered to the Africa Korps in 1941. There the large tires would have beenparticularly useful for driving over the trackless wastes. As you can see, thereis a difference of opinion between the kit instructions and the reference Iused. Anyone who would like to add to this is most welcome to contact me aboutit. 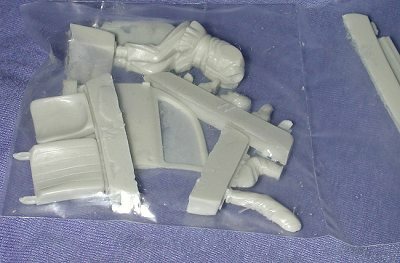 FIrst off, you get the same sprues as in the VWtype 82E (shown above, though the decal sheet for the type 87 is different). 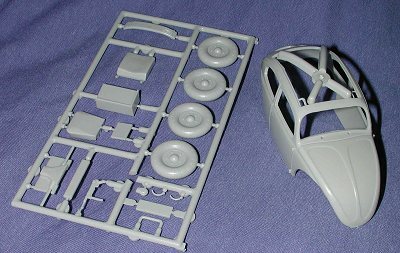 Youalso get an additional sprue that is specifically for the four wheel drivecabriolet. On that sprue (shown to left), are the oversize tires, the new backseat, the extra shelf, new door handles, the front 'differential' plate and therolled back canvas top. Actually, this top piece isn't very well done. You canprobably do just as well if not better by rolling some cut paper towel andsoaking it in a solution of white glue and water. The other different bit is, ofcourse, the body. In this case the open-top cabriolet instead of the sedan. The other bits that areincluded with this kit are the resin ones. This includes a new door (the kit onemust be cut out), a new door sill, a new drivers seat (this one is cut out sothat the figure will fit), new resin interior handles (you have to cut off theones on the passenger door) a secondtransmission handle and a driving figure. This figure has separate arms, head,hands and feet. Really, the only difficult part will be removing the kit door.However this can be easily done by scribing along the opening several timesuntil it finally comes loose. Then it is a simple replacement. The kit instructions have anaddendum sheet in it telling you exactly how to do this and where all the resinpieces go. Everything else is the same. 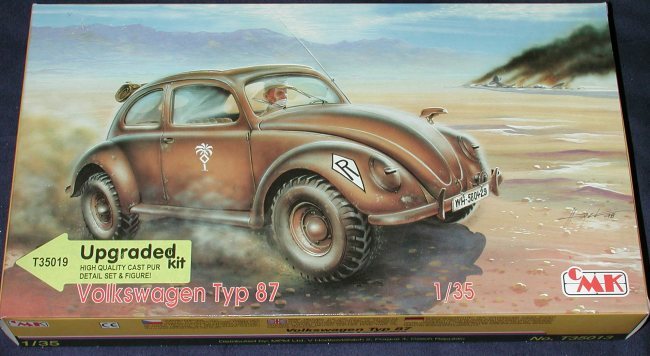 There is only one decal option and thatis for an Afrika Korps car in overall sand yellow inside and out, with redleather seats. Having built the type 82E, I cantell you that it will build into a very nice model and one that will look nicein your collection of military vehicles.